My test drive of the new Prius v convinced me that you can get 42 MPG with comfort for 5 people and the flexibility to hold the cargo carried in most SUVs. The Prius v will shake-up the crossover SUV and wagon market when it soon goes on sale in January starting at $26,400, only about $3,000 more than the classic Prius. The iconic Prius Liftback is not going away. Prii is now a family of four, with the Prius v being the largest. For those sick of $100 fill-ups, but unable to compromise on passenger and cargo room, the new Prius v delivers 44 MPG city, 40 highway, and 42 overall MPG. Master its EV and ECO modes and you’ll save even more at the pump. 42 MPG is a huge savings over the best current SUV mileage of 32 MPG with a Ford Escape Hybrid. 42 MPG is double the average SUV. This mileage breakthrough is for real. I drove the Prius v harder than normal for 39 miles, up and down steep grades and accelerating in Power mode on the freeway. My actual mileage was 40.2 as I wound through the streets and hills of Monterey, California. Toyota has not yet announced pricing. Clean Fleet Report speculates that the price will start around $26,000, about $3,000 more than the Prius Liftback. You should save over $1,000 per year in fuel and maintenance, compared to the average SUV, crossover, or midsized wagon. The Prius v uses the identical hybrid Synergy drive technology as the classic Prius Liftback, the best selling hybrid of all time; the new Prius v is 6.1 inches longer, 1.2 inches wider, and 3.3 inches taller. If you have a big home project, the front seat can fold flat, providing up to 50-percent more interior cargo space than the current Prius. Toyota says that “v” is for versatile and sees a big market in active families. Comfortable seating for five will appeal to active families. Sliding second row seats allows for extra rear-storage flexibility, with a 45-degree recline for greater comfort. The 60/40 split, folding rear seats present four different seat arrangements that provide excellent usability for passengers and luggage, while a fold-flat front-passenger seat allows for extremely long cargo, like shelves for a home project followed by a surfboard for the beach. Available options include energy-efficient LED headlamps, Dynamic Radar Cruise Control with a Pre-Collision System (PCS), and Advanced Parking Guidance System. For safety, there are seven airbags, a high-strength cabin and an energy-absorbing body structure with impact beams, cross members and leg absorption pads. New driver and front-passenger seat design helps lessen possible whiplash injury during a collision. I push the start button and barely hear the 134 hp engine. Like the current generation Prius, the dash and display are easy to see and use. Four driving modes (Normal, Power, Eco and EV) satisfy a variety of road conditions and driver preferences. A Smart Key System with Push Button Start, an electronic shift lever, Hill Start Assist Control (HAC), and a back-up camera are standard. I touch the ECO button because I am more concerned about fuel economy than performance. 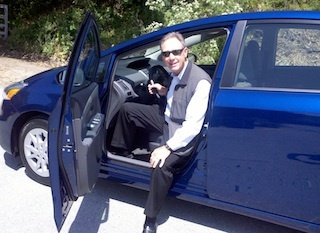 Driving the v is familiar – it is another Prius. Power steering is effortless. Visibility is good from all windows and side mirrors, and better through the rear window than in the Prius Liftback. After a few miles on busy streets, I enter the freeway, I touch ECO to accelerate in Normal mode. I merge easily with traffic and accelerate from 20 to 70 mph. Acceleration is fine, unless you enjoy performance. It certainly is not a Tesla Roadster. The Prius v only adds 230 pounds to the Prius classic and uses the same drive system, so the Prius v is a bit slower, accelerating zero to 60 in 10.1 seconds, a second more than the Liftback. You can touch the Power button when you want more performance. Wind resistance is minimal with its .29 coefficient of drag, lower than competing crossover SUVs. In a couple of miles, I leave the freeway to take Highway 68 towards Salinas. Passing the fields rich with a bounty of food, I again notice that the Prius v is as smooth and quiet as the bestselling Liftback. Going up 8 percent grades on Laureles Grade, the Prius v performed adequate in ECO mode and proved a good hill climber in Power mode. Taking curves where I might have felt a bit top-heavy in some SUVs, the Prius v with a lower center of gravity glided through the curves. For part of the drive, I took a turn as passenger in the rear seat, which had enough room for three adults or two 7-foot basketball players. Even with the rear seat forward for extra rear cargo, there was abundant legroom. Front and rear doors even have a concave shape for more leg comfort. The interior is practical and more environmentally friendly. The seats are SofTex-trimmed, a material that reduces weight and reduces VOC emissions by 99% during manufacturing. No fancy leather and wood that premium SUV drivers enjoy, just comfortable seats and trim designed for years of active use. 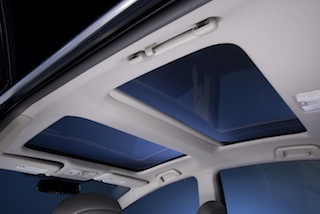 Unfortunately my test car did not included the optional Panoramic View moonroof with power retractable sun shades that provides an open atmosphere in the cabin with a 40-percent reduction in weight as compared to conventional glass roofs of the same size, and excellent heat insulation. A nice Toyota innovation for more sunlight without demanding more A/C or heat. On a quite street, I touch EV to drive the car in pure electric mode. Accelerating with the care of walking on eggshells, I could not keep the car in EV mode as it quickly defaulted to ECO. I’ve had the same experience in all other Prii except the new Prius PHV. Without working to get good mileage, the actual results of this drive were 40.2 mpg. If I had cruised city streets at 30 miles per hour in ECO mode, mileage would have been better. The Prius v delivers a quite, smooth, and responsive drive. Disclosure: For the unveiling and long test drive of the Prius v, Toyota picked-up the tab for one hotel night and some tasty seafood in Monterey for me and other automotive journalists. My article was not seen by Toyota prior to publication, nor influenced by Toyota. For years, the Prius has been popular with fleets that want to save millions in fuel over a period of years and like the green image. These same fleets have also bought SUVs for other needs with the greenest being the Ford Escape Hybrid. There are many applications where the added cargo of the Prius v will now make it the vehicle of choice including taxis, part of car sharing fleets, delivery applications where a bigger van is unnecessary, sales and service, and government fleets. 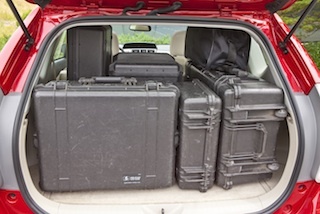 Most of the million existing Prius drivers have learned that the folding 60/40 backseat of the Prius liftback meets their cargo needs including trips to the big box stores, room for two bicycles, and work and family demands. Some, however, are ready to buy a new Prius and will pick the larger Prius v at 42 MPG over the Liftback, which delivers 50. With the Prius v, Toyota is going after the 3 “Es” of small and crossover SUVs – the Escape, the Equinox, and the Element. With high gas prices, the Prius v with 42 mpg will cause people to rethink their plans for other crossovers. The v will take some business from the Ford Escape Hybrid, the current SUV mileage champion at 32 mpg. The Prius v will not be for everyone. Some will insist on a bigger SUV. Others will want premium leather and wood. Kids will campaign for entertainment screens for backseat passengers, not available on the Prius v. Some active families will insist on seating for 7 or 8 including second row lounge seats. The Prius v only seats 5. For those who must drive through snow and ice, AWD SUVs such as the Ford Escape Hybrid and Lexus RX450h will win. Many winter drivers will find good fuel economy from AWD non-hybrids from Subaru and Audi. Next year, the toughest competitor to the Prius v is likely to be the Ford C-MAX, an equally attractive new generation crossover will fuel economy options that include hybrid and plug-in hybrid, seven seats, and sliding side doors. 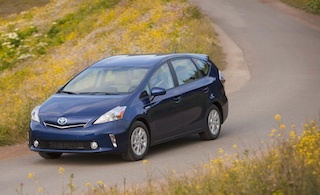 The Prius v will use NiMH batteries, just as the 2011 Prius. Next year, Ford will start delivering lithium batteries in all hybrids and electric cars including the C-MAX. Yes, the Prius v will shake-up the crossover SUV and wagon market when it goes on sale. It provides good handling, 4 modes for different drivers and roads, excellent cargo versatility, and the opportunity to save $5,000 to $10,000 over the life of the car in fuel and maintenance compared with many SUVs. 2011 EPA MPG estimate. Actual mileage will vary. Bore x Stroke 3.17 x 3.48 in. Shoulder Room (Front/Rear) 55.9/55.2 in. Hip Room (Front/Rear) 53.5/53.5 in. Passenger Volume 97.2 cu. ft.
With rear seat upright: 34.3. Star Safety System ™ – includes Enhanced Vehicle Stability Control (VSC), Active Traction control (TRAC), Anti-lock Brake System (ABS) with Electronic Brake-force Distribution (EBD), Brake Assist (BA), and Smart Stop Technology (SST). Display Audio with Navigation and Entune™* includes: 6.1-inch touch screen with integrated backup camera display, AM/FM CD player with MP3/WMA playback capability, six speakers, SiriusXM™ Satellite Radio (includes 90 day trial subscription) HD Radio™ with iTunes® Tagging, auxiliary audio jack, USB port with iPod® connectivity and control, vehicle information with customizable settings, hand-free phone capability, phonebook access, advanced voice recognition, text to voice with programmed and customizable text responses, and music streaming via Bluetooth® wireless. Tilt/telescopic steering wheel with audio, climate, Bluetooth® hands-free phone and voice-activated navigation controls. Entune* – includes Bing, iheartradio, MovieTickets.com, Open Table and Pandora. All Entune features are included in three years of access to Entune Services. We’re here to serve. Glad you enjoy our observations. –ed. How does this new SUV model handle in snow and ice?